QUESTION: Did the Deep State indict the Russians to sabotage the Trump Putin summit? The Daily News seems to be cheering World War III. What is going on? ANSWER: The Justice Department DELIBERATELY indicted Russians they can never put on trial and it was done days before the summit to intentionally disrupt it and set the fake news up to maintaining that Russia is the enemy. In other words, we should not talk with an enemy but we should just declare war. It really is mind-blowing how the press is so intent upon creating war with Russia. They argued against peace in North Korea and they take the same tactic with Russia. The press and Deep State are simply positioning people to support a war and the Democrats are becoming the party of war and anti-Russia. 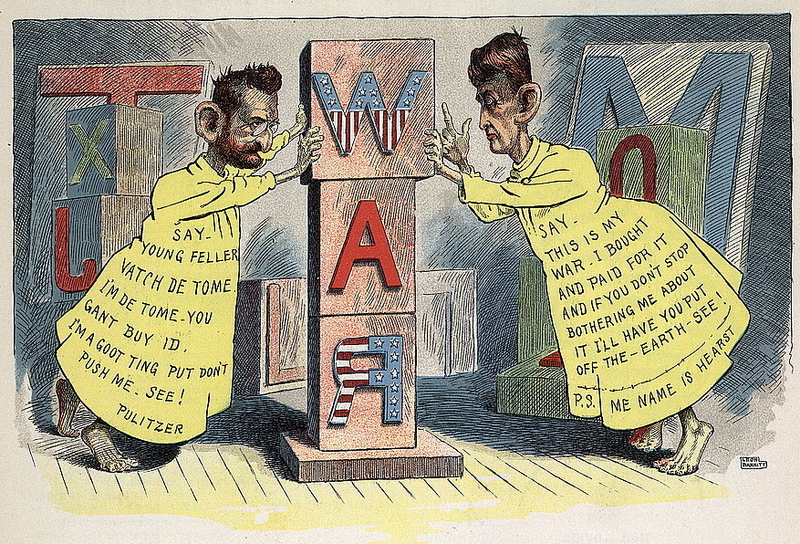 I remember in history class back in high school how they blamed the Spanish American war on Pulitzer and Hearst who created a war with fake news just to sell their newspapers. The competition between them was all that mattered. It became known back then as “Yellow Journalism”and the most ironic fact to come from this is that journalists today cherish winning a Pulitzer Prize for journalism that is named after the father of what we call today “Fake News”! Today, journalists keep bashing Trump for pointing out that they are indeed using their power to push personal views. Nothing has changed. In Asia, I am asked what is wrong with CNN? They no longer report the news, it is all about overthrowing Trump because their corrupt candidate, Hillary, lost. 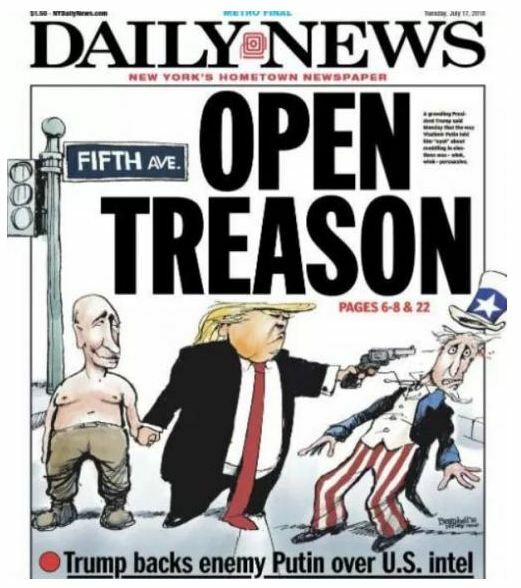 The Daily News has been especially outrageous in that story regarding Putin and they were not finished with distorting the entire summit. They tweeted that Trump “derides reports with which he disagrees as ‘fake news,’ then buys the Russian narrative hook, line, sinker, pole, and boat.” Catherine Garcia. Garcia has NEVER looked at the evidence behind the Magnitsky Act. Is this intentional or is she so biased that she sees no need to actually investigate anything? Not a single major news organization bothered to report that Putin said Mueller can go to Russia and interrogate who he wants if Russia can do the same with respect to the Hermitage Capital incident that involved the blackmail of Yeltsin, the charge against Bank of New York for $7 billion money laundering, and Republic National Bank/HSBC. 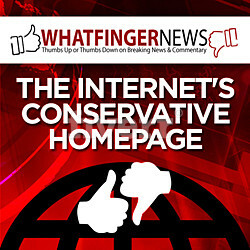 Where is the independent reporting? Where are the real investigative journalists? Not a single major news outlet bothered to report that offer or even question what was it about? A real news organization would be unbiased and at least report what allegations Putin is making. So what does Garcia want? Does she want a Pulitzer Prize for creating World War III? I have PERSONAL knowledge of what Putin was talking about. The attempt to take over Russia and blackmail Yeltsin is what resulted in Yeltsin turning to Putin for help, to begin with. Putin clearly states that the USA is free to go interrogate the Russians they have indicted and the press declares guilty without any trial PROVIDED that Russia can interrogate Americans and Bill Browder for interfering in the Russia democratic process. They BANNED the film The Forecaster in the United States yet it appeared all around the world and has been on flights on airlines to the USA. They have also BANNEDthe documentary on Bill Browder’s story: Magnitsky Act: Behind the Scenes. Why are two films that touch on the subject of Russia BANNED in the USA? Who is behind the cover-up? The Forecaster was even on TV in Canada. It is BANNED by the networks in the USA, the news, and Netflix. Why? Because it shows that there were people in the United States who were interfering in the Russian elections blackmailing Yeltsin not to run and to stuff their own puppet in as President of Russia without an election? You are supposed to be INNOCENT UNTIL PROVEN GUILTY, and the pledge of allegiance kids had to recite in school was just propaganda – “Justice for All” when the press has declared Russia is guilty simply because the Justice Department strategically indicted Russians they know there will never be a trial where their claims must be presented. The media simply reports whatever the government says without investigation. They KNOW the DOJ will never have to prove anything in a court before a jury since they cannot arrest Russians in Russia. The DOJ can say whatever it wants and it then says proof cannot be revealed before a trial – very convenient. The press does NOT care about the rule of law. They accept whatever the DOJ says knowing it never has to prove anything or put forth the evidence because they hate Russia and Trump. There is nobody in the press who bothers to investigate anything said ever by the DOJ. They know that. So the press cannot prove what they report is “fake news” when there is no independent investigation. It is becoming painfully obvious that everything Americans once stood for is long gone. The Deep State intentionally sabotaged the summit and the press has conspired with the Deep State to desperately try to overthrow Trump so they can get back to the corruption that ruled the country for decades. The sad part is the press has only exposed how corrupt they really are and the complete lack of dignity or ethics. There is NOT a single major news outlet that would EVER report the blackmail of Yeltsin to attempt to take over Russia. There just seems to be no hope. They will intentionally continue down this path which will only lead to the Civil War by polarizing people on both sides with propaganda. It truly is disgusting.